One of our leaders, Ellen Deighton, who is an Assistant Leader with Church Aston Guides (Wrekin Division), is running the London Marathon in April 2017 for Girlguiding. “I was lucky enough to be selected for one of only six places to raise money for Girlguiding by running the marathon, and I need to raise £1800 by the marathon date of April 23rd. I’ve been involved with Girlguiding for over 26 years, as a girl and as a leader, and I’ve just come back from spending almost four years living in Oklahoma, where I volunteered with Girl Scouts of the USA. I couldn’t think of a better way to jump back into it than by combining my passion for Girlguiding with my love of distance running! I’ll be organizing various fundraising efforts to get to my goal of £1800, so please keep your eyes peeled for upcoming opportunities to help me reach that total! In the meantime, donations are always welcome at my online fundraising page: www.virginmoneygiving.com/ellenrunslikeagirl . If you have any questions about the marathon or my fundraising, or any suggestions, then I would be glad to hear from you! Feel free to contact me at ellen_deighton(at)hotmail(dot)com. 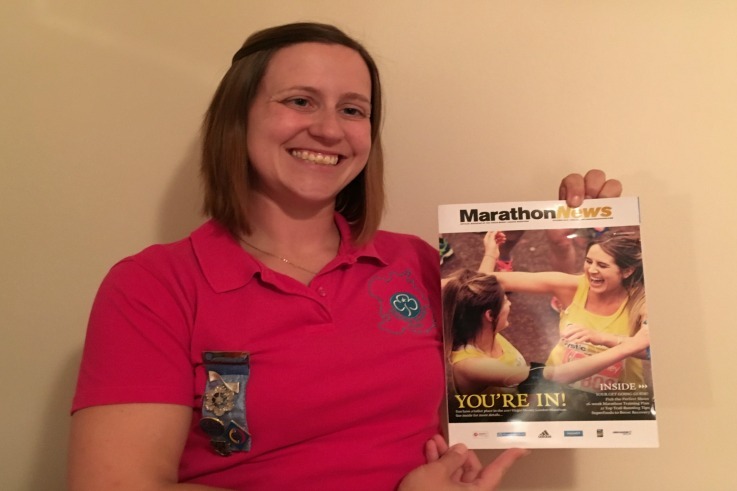 Ellen is pictured below with the magazine telling her she got the place in the marathon, and also running the New York City Marathon in 2016.